1. Name one thing that completely took you by surprise when you first started Conspiracy Showroom - something that neither biz how-to books or any 'SCORE' workshop prepared you for. 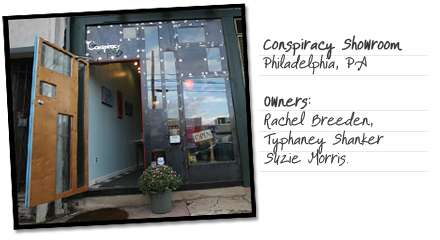 We opened Conspiracy as a co-op boutique, a concept that was not widely discussed in business books or anywhere, really, so the whole thing was a surprise. We sort of made it up as we went along, using our limited business knowledge, foolish optimism, and stubborn determination. 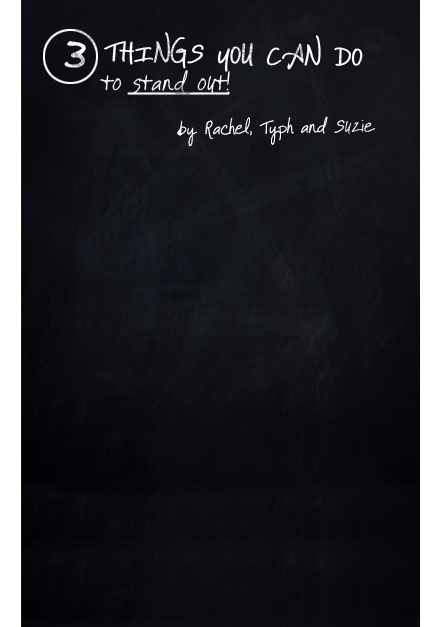 Throughout the opening process, Suzie and Rachel kept a running list of the 'the next time we open a business' tips. It's been a great experience though - you learn by doing, not by daydreaming. Throughout the opening process, Suzie and Rachel kept a running list of the 'the next time we open a business' tips. It's been a great experience though - you learn by doing, not by daydreaming. 2. What's the biggest misconception that people have about owning a shop? I think the idea that you will make money that you can actually keep, especially at first. Almost all of the money that comes into the shop goes right back out, either as designer pay-outs or operating costs. It takes a while to get over that hump. 4. Some say that the best business partners complement each other's strengths and weaknesses. How do the three of you balance each other out? When we started brainstorming about Conspiracy we determined what each of our strengths were, and decided that we'd each stick to what we were best at. It has worked out perfectly for us since we each add a little part to the puzzle that makes the whole thing work. Suzie handles the books and is also our idea gal - she's largely responsible for the physical appearance of the store. Typhaney is our go-to PR and networking guru. Rachel handles all graphics and writing for our website, online shop, and store. 5. Do most of the other designers you carry come to you or do you actively seek out new designers? If so, where? When we first opened the store we spent a lot of time and energy searching for designers to carry in the shop. We found many of them on etsy.com; that site as some amazingly talented people. After we got some press behind us and got our name out there, we reached the point where designers were seeking us out. It helped us relax a bit and focus on our own creativity - it is very easy to get so caught up in the business-end of things that you forget why you opened a store in the first place - to sell your own stuff! 1. First and foremost, we appreciate when someone has taken the time to get to know what we're about and has read our site, including the submission policy info. We can't stress enough that walk-ins and cold calls are not the best way to go about submitting work. 2. Second, be sure the items are well-made. We love designers who are just starting up, but the quality of work is so important. It doesn't matter if you make it out of your bedroom so long as you make it to last! 3. And finally, our focus at Conspiracy is on handmade, non mass-produced items. We like to know that your work is not the product of sweatshop labor from the other side of the globe. 6. I know that all three of you are also designers and all met at the Antiquarian Market. Any Do's and Don'ts' you can share when it comes to selling at fairs? We have one tip - open your own store so you don't have to haul your work around anymore! 7. I once heard someone say 'A business that doesn't grow eventually dies...' how has Conspiracy Showroom evolved since you first opened your doors back in 2006? Well, our original concept was the co-op boutique. We had a high-minded idea to help our fellow designers get their work out to the public and to make everyone (but us) money. We realized that in order to keep the whole thing afloat we needed to tap into our capitalist side and focus on ourselves to generate income for the store. We also used to have monthly art openings that were really a drain on our time and resources; we've since scaled back to a few select events per year and the results have been great. Quality not quantity! We would increase our curb appeal and then have a party to celebrate! Thanks Rachel, Typhaney and Suzie!! Oh, what a lovely shop! I am coveting those gorgeous earrings and those beautiful clutches they have on their site!~Yum!